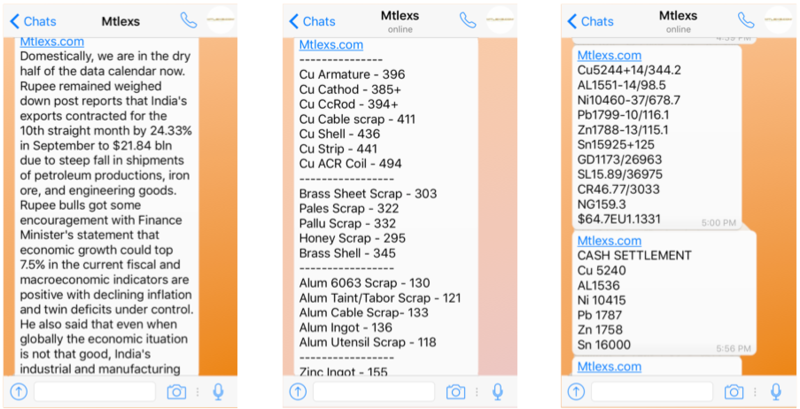 Mtlexs.com is inviting companies to register themselves and showcase their product information to buy or sell purely related to Non Ferrous Metals. # Knowing your business, will help us serve you better. *GST as applicable will be additional. Use coupon code 'PROMOMT' to get 25% discount on Membership fees. The domain name www.mtlexs.com (hereinafter referred to as "Website") is owned by Mtlexs, a Partnership firm incorporated under the Partnership Act, 1932, having its registered office at 2B, 1st floor, Karuna building, Opp. Manav Mandir road, Mumbai – 400006. (hereinafter referred to as “The Partnership”). The membership of this website is available only to those above the age of 18 barring those ‘Incompetent to Contract’ which inter alia include insolvents and the same is not allowed to minors as described by the Indian Contract Act, 1872. If You are a minor and wish to use the website, you may do so through your legal guardian and Mtlexs.com reserves the right to terminate your account on knowledge of You being a minor and using the membership of the site. Further, You are solely responsible for protecting the confidentiality of your username and password and any activity under the account will be deemed to have been done by you. In the case that you provide us with false and inaccurate details or the Partnership has reasonable reasons to believe you have done so, We hold the rights to permanently suspend your account. We take reasonable care to ensure accuracy of the information on our website but, You agree to not to make us liable for the falsification of any such provided information. 1. All communication which inter alia include the contract, its terms, your obligations, the vendors obligations, prices, etc are outcomes of the communication between the vendor and You. This includes, without any limitation, the prices, period and mode of delivery, shipping costs (in case of goods), payment details, date and warranties related to products and services and after sales services related to products and services. We do not have any control over such information and play no determinative role in the finalization of the same and hence do not stand liable for the outcomes of such communication. 2. We do not endorse or promote any of the products or servicesoffered on the website nor place any guarantee as to its nature, price, quality, etc. 3. Subject to the above sub-clauses, a contract exists between the vendor and the customer and as such any breach of contract and thus, any claim arising from such breach is the subject matter of the vendor and the customer alone and we are in no way a party to such breach or involved in any suit arising from the same breach. The contact/communication arising from such breach may entail between the vendor and the customer directly without Us being involved. 4. As the customer, you are expected to check the creditworthiness of the vendor and the genuineness of the products and services offered by them. We are not liable for the same. 5. At no point of time between communication and delivery of goods and services between the vendor and the customer do we come into possession of the goods or its title, or receive any services offered. 6. We do not collect any commission from the customer or the vendor for the transactions that take place through our website. 7. As the contract is limited to the vendor and the customer and not Us, we are in no way liable for any deficiency of service that may arise which includes and is not limited to cancellation of the customer’s order due to low stocks, defected goods, and defective nature of goods, lack of free dates, overbooking of services or for any other reason. 8. As we hold no possession, nor title of the products at any time, or enter/determine the communication between the customer and the vendor or determine its outcome, the contract is purely a bipartite contract between the customer and the vendor and We are not responsible for claims arising from such a contract. Disclaimer: Due to some technical issue, typographical error or product information published, Pricing on any product(s) as is reflected on the Website by vendor may be incorrectly reflected and in such an event vendor may cancel such your order(s). 9. We may display advertisements on our website. These advertisements are paid for by the respective vendors and we do not in any way promote or endorse the goods or services offered through these advertisements nor place any guarantee as to its nature, price, quality, etc. 10. You release and indemnify Us and/or any of its officers and representatives from any cost, damage, liability or other consequence of any of the actions of the Users of the Website and specifically waive any claims that you may have in this behalf under any applicable law. Please note that there could be risks in dealing with underage persons or people acting under false pretense. The Website may be linked to other sites, which are not maintained by the Partnership. The Website is not responsible for the Content of those sites. The inclusion of any link to such sites does not imply endorsement, sponsorship, or recommendation by the Partnership of the other such sites. 9.1 You are bound not to cut, copy, distribute, modify, recreate, reverse engineer, distribute, disseminate, post, publish or create derivative works from, transfer, or sell any information or software obtained from the website. With our prior permission limited use may be allowed. For the removal of doubt, it is clarified that unlimited or wholesale reproduction, copying of the Content for commercial or non-commercial purposes and unwarranted modification of data and information within the Content of the Website is not permitted. 9.2 You agree not to access (or attempt to access) the Website and/or the materials or Services by any means other than through the interface that is provided by the website. The use of deep-link, robot, spider or other automatic device, program, algorithm or methodology, or any similar or equivalent manual process, to access, acquire, copy or monitor any portion of the Website or Content, or in any way reproduce or circumvent the navigational structure or presentation of the Website, materials or any Content, to obtain or attempt to obtain any materials, documents or information through any means not specifically made available through the Website. You acknowledge and agree that by accessing or using the Website or services, You may be exposed to Content from other users that You may consider offensive, indecent or otherwise objectionable. We disclaims all liabilities arising in relation to such offensive Content on the Website. Further,You may report such offensive Content. TO THE MAXIMUM EXTENT PERMITTED BY APPLICABLE LAW, WE WILL HAVE NO LIABILITY RELATED TO USER CONTENT ARISING UNDER INTELLECTUAL PROPERTY RIGHTS, LIBEL, PRIVACY, PUBLICITY, OBSCENITY OR OTHER LAWS. WE ALSO DISCLAIMS ALL LIABILITY WITH RESPECT TO THE MISUSE, LOSS, MODIFICATION OR UNAVAILABILITY OF ANY USER CONTENT. THE USER UNDERSTANDS AND AGREES THAT ANY MATERIAL OR DATA DOWNLOADED OR OTHERWISE OBTAINED THROUGH THE WEBSITE IS DONE ENTIRELY AT THEIR OWN DISCRETION AND RISK AND THEY WILL BE SOLELY RESPONSIBLE FOR ANY DAMAGE TO THEIR COMPUTER SYSTEMS OR LOSS OF DATA THAT RESULTS FROM THE DOWNLOAD OF SUCH MATERIAL OR DATA. WE ARE NOT RESPONSIBLE FOR ANY TYPOGRAPHICAL ERROR LEADING TO AN INVALID COUPON. WE ACCEPTS NO LIABILITY FOR ANY ERRORS OR OMISSIONS, WITH RESPECT TO ANY INFORMATION PROVIDED TO YOU WHETHER ON BEHALF OF ITSELF OR THIRD PARTIES. This Terms of Service shall be governed by the laws of India. 13.1 Stage 1: Mediation. In case of a dispute, the matter will first be attempted to be resolved by a sole mediator who is a neutral third party and will be selected at the mutual acceptance of a proposed mediator by both parties. Both parties may raise a name for sole arbitrator and in the case both parties accept the proposed name, the said person shall be appointed sole mediator. In the case the parties are not able to reach a consensus within two proposed mediators, the Partnership reserves the right to decide who the final mediator is. The decision of the mediator is not binding on both parties however, the parties in good faith will attempt to bind by the decision. 13.2 Stage 2: Arbitration. In the case that mediation does not yield a result suitable or preferred by any one of the parties, arbitration may follow, the award of which is binding on both parties. The Arbitration Board is to comprise three members. One is to be appointed by each party and the third member is to be nominated by the two appointed members by mutual consent between them. The award as the outcome of the arbitration is final and binding on both parties and there shall be no further remedy available to both parties. The arbitration proceedings will take place in the English Language and will be situated in Mumbai,State of Maharashtra. The mode of appointment of the arbitrators is as provided above.